For some reason I've been loving the look of baskets in every room. To me it adds a bit of an eclectic, natural feel, a bit of zen, & adds some texture as a decor element. I am thinking of purchasing the same baskets I have organizing my art stuff on my side of the big bookshelf for the bookshelves flanking the entertainment center as added storage for games, cords, controllers, etc. I also have baskets (that are falling apart they are so old!) in our bathroom upstairs & Zach actually got a mirror/medicine cabinet for the bathroom downstairs that has basket slots & baskets. We've also got a basket under the coffee table for random laptops, iPads, magazines, etc. That's a lot of baskets! We've got just a gray, Sterilite storage tub for our recycling. I think it would be cool to have something to put the tub in that looks a bit prettier & is less unsightly. I really don't like seeing it sitting in the dining room! Our dining room is right off the kitchen so it's not that weird that it's in there! The texture of these baskets is my favorite. In the upstairs bathroom the baskets have that sort of texture. It's sort of hap-hazard & more casual. Not so stand out-perfect basket & I really like it. We don't have a big laundry room but we do have shelves above the washer & dryer. Right now junk is just piled up there in a semi organized fashion - swiffer stuff, extra paper towels, light bulbs, clorox wipes, towels, sheets, etc - but baskets would keep things from falling on me! And it would just look nice right? Right now I have my purses hanging on shower hooks in the back of our closet - a great idea I might add. There are so many uses for the shower hook! 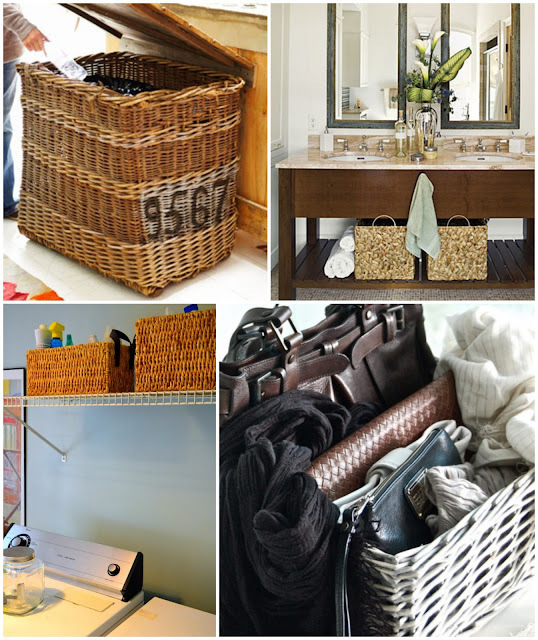 But I'm loving this idea using a basket to organize/store maybe most used clutches/bags/wallets/etc. Our bedroom is super small & I never thought about the fact that when you live with someone & share the same room with someone where does all your crap go? I mentioned on twitter that I'm really excited to finally use a bedroom as a bedroom and not a craft room/blog room/etc room that I feel my bedroom has been my entire life! Now there are other rooms for that. But back to the basket - I think this would be cute under my vanity or maybe replacing the yarn basket (!!) under my night stand. Show me some of your home inspiration! I'd love to see it! Wonderful home decoration. thanks for sharing.